I tried searching but can’t really find any. Any idea if they have Subaru stuffs? I tried searching but cant really find any. Any idea if they have Subaru stuffs? Forester stuffs quite a lot there. What's the keyword for spiral cell agm batteries? Interested to try AGM as it's know for quick charge and deeper discharge tolerance. How much it cost you plus shipping? There are also OEM BMW/Bosch AGM battery around. I usually go by sea shipping SGD$100 for 1 CBM regardless of weight. 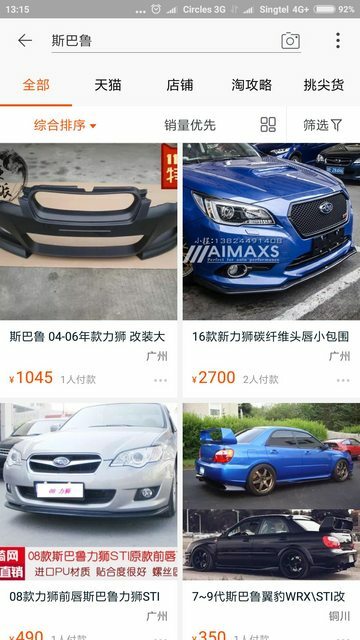 can taobao enthusiasts open separate thread to share car part/accessories lobangs found on taobao? And open separate thread for car scraping tips? This thread is going off topic. u mean making new mats?